Paintless Dent Removal (also referred to as Paintless Dent Repair) is the process of removing dents from vehicles. Unlike the panel beating process, the concept of paintless dent removal uses specific techniques and unique tools to push or pulls dents without damaging the paint or for that matter the need for any respraying. Hailstorms make up the majority of the demand for PDR work although dents created by hits in car parks keep PDR Technicians busy most other times of the year. PDR Technicians are most often mobile although some remain fixed in specific locations such as with panel beating companies. Other companies employ PDR Technicians during the hailstorm season. The Dent Shed is one such company that has developed structures to become mobile at any time of the year on extremely short notice. 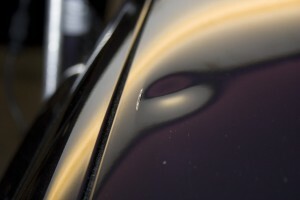 The work of PDR is carried out by paintless dent repair technicians. As many are finding out – this is a highly paid field and technicians in great demand during major hailstorms! Although PDR Technicians roam around the country and sometimes internationally to chase hailstorms in particular for work, they utilise radar or feed off other sources for information. Very few have the technical knowledge to understand how hailstorms can be forecast particularly in countries outside the United States. There are hailstorm forecasting services in Australia available to assist in getting to the storms quickly and before they even happen.